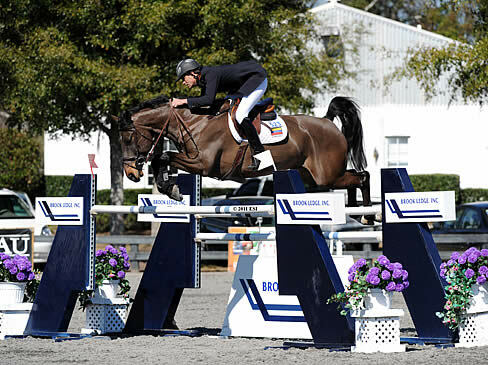 Wellington, FL – December 4, 2011 – The 2011 edition of Equestrian Sport Productions’ Holiday and Horses show concluded today with the $20,000 USHJA International Hunter Derby as the highlight class in the International Arena. Kelley Farmer of Keswick, VA, rode Nancy Amling’s Taken to the win. There were 18 entries in the derby, and the top 12 returned for a second handy round. Farmer and Taken held the lead through the first round, which they set by scoring a 180. They returned as last to go in the handy round and with handy bonus points of 8 and 9, they bettered their score with a 188. Their total of 368 gave them the win by three points. Second place went to Kristy McCormack and Sundance, who received scores of 175 and 189.5 from the judges – they had a spectacular handy round – for a total of 365. Elizabeth Kenny and Bravo van de Kwaakelhoek finished on a total of 363 for third place, while Farmer placed fourth with AM Free’s Bases Loaded at 350 points. Generous and David Olinyk also had 350 points for fifth place. Traverse City, MI – July 22, 2011 – With few clouds in the sky and a light breeze, it was a lovely afternoon for the $20,000 USHJA International Hunter Derby at Horse Shows by the Bay Series III. The Flintfields Horse Park grounds were buzzing all day with excitement for the evening’s event, which challenged 21 entries with a traditional course in the Grand Prix ring. Kelley Farmer made a clean sweep of the top four spots on Clearly, Praise, Red Sky, and Bases Loaded. Amazingly, Farmer and her first three rides produced a three-way tie involving an overall high score of 387. Peter Pletcher smoothly jumped into the next three places on Copperfield, Primero, and Tell All, accumulating several highly impressive scores of his own. An enthusiastic crowd turned out for tonight’s derby, making the class a definite favorite among spectators and riders alike. The event kicked off with an exhibitor party, generously sponsored by Outback Steakhouse of Traverse City, which featured great food, drinks, and conversation. The first horse took the course at 5:30pm, with high scores dominating the scene from the very start. Kelley Farmer and Bases Loaded hit a home run with a combined score of 180 in their first round. Bases Loaded is owned by Am Free, Inc. Peter Pletcher and Copperfield, who is owned by Jennifer Noski, also turned in a great early combined score of 171 in the first round. Carson Gibson and Caden, owned by Shadyside Farm, had a flowing first round that resulted in a solid 163 combined score. 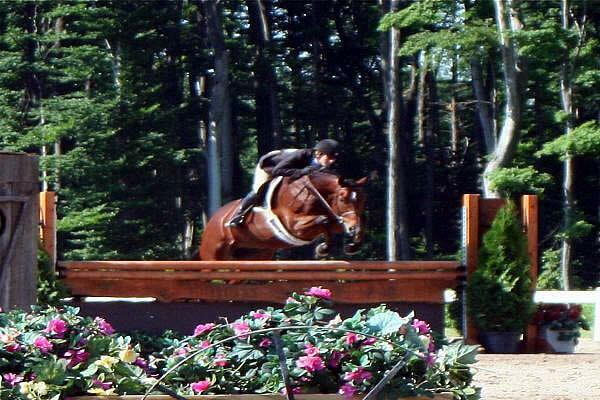 Farmer returned on Clearly, owned by Jane Gaston, to add a 185 combined score to her growing list of first round feats. Farmer’s highest first round score came on Red Sky, owned by Larry Glefke. A whopping 196 put Farmer in contention for a second derby win, but Pletcher was also a competitive presence in the Grand Prix ring tonight. On Tell All, owned by Susan Baker, Pletcher earned a 173.5, adding to the slew of stunning scores in the much-anticipated derby. Near the end of round one Farmer returned on Praise, owned by Selma Garber, and received plenty of praise for another high score of 191. Traverse City, MI – July 21, 2011 – With the weather hot and steamy today at Horse Shows by the Bay Series III, riders were literally rolling up their sleeves and getting down to business. Hunt coats were waived as the day progressed, adding visible intensity to the competition in the hunter rings. By day’s end, Peter Pletcher had earned the impressive Grand Performance Hunter title, blazing past the host of skilled equestrians entered in this week’s classes. Kelley Farmer continued to impress as well, sweeping the Conformation Hunter division with a scorching set of wins. Both the Performance Hunter and Conformation Hunter classes took place in the R. L. Polk Family main hunter ring at Flintfields Horse Park in Traverse City, MI. With nine entries, the 3’6″ Performance Hunter division was bound to be both competitive and fun. Peter Pletcher and Sleepy P Ranch’s Primero earned the top honors with 31 points throughout the division. Primero and Pletcher have had a very successful time so far at Horse Shows by the Bay in the High Performance division. There was a tie for reserve champion this week in the 3’6″ Performance Hunters between Kara Roposa on Carentino, owned by Alexander Cooper, and Caroline Weeden on Condanas, owned by Lacey Gilbertson. Both horse and rider pairs earned a total of 16 points and with neither riding in the under saddle portion, they both had the same number of points over fences and were able to share the title. Traverse City, MI – July 6, 2011 – Perfect summer weather greeted the first day of the first week of Horse Shows by the Bay in Traverse City, MI. The professional hunters took full advantage of the perfect weather and perfect footing in the R. L. Polk Family Main Hunter Ring. Kelley Farmer of Keswick, Va., and Straight Talk, owned by CH Farm, LLC, won big today in the $2,500 First Year Green Working Hunter, sponsored by Equisport Insurance Agency-Dan and Beth Graves. Cookie Beck and Erynn Ballard split the winnings in the Second Year Green Working Hunters. Kelley Farmer had a fantastic day on all three of her rides in the First Year Green Hunter division today, topping each class on Straight Talk. She and Straight Talk had strong, smooth, confident rides in both classes and went straight to the top of the under saddle class. Coin Toss, owned by Am Free, Inc., jumped into second in both over fences classes and the under saddle with Farmer aboard. “My horses were great! I’m so happy with all of them, actually. It’s a beautiful place and they try to do everything, you know, last year the footing needed a little fixing and they did it and it’s beautiful now. That’s why I come back, my horses love it here, and everything you ask Alex [Rheinheimer] to do it will be done. 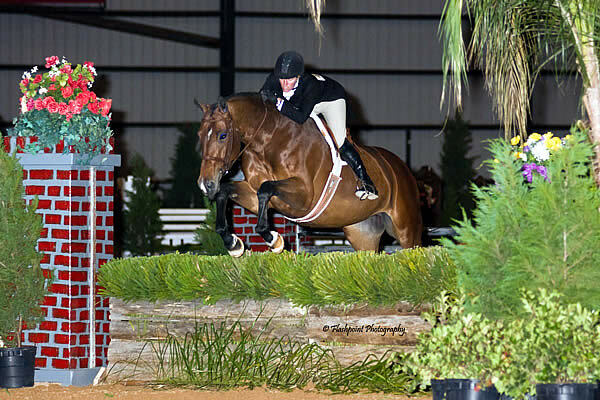 She goes out of her way to go above and beyond to make a beautiful horse show,” Farmer exclaimed. Peter Pletcher of Magnolia, TX, also made quite an impression today in the Equisport Insurance Agency First Year Green Hunter division on both of his mounts. Peter and Valobra, owned by Eva Bisso, earned both a fourth and fifth place ribbon over fences and a third under saddle. Sue Copeland’s Isaiah and Pletcher won a fourth and a fifth over fences and a sixth in the under saddle class. © ESI Photography. Andres Rodriguez and Davinci in the $25,000 HITS Grand Prix, presented by Pfizer Animal Health. OCALA, FL (January 24, 2011) – The Ocala January Classic came to an end on Sunday and was highlighted by the $25,000 HITS Grand Prix, presented by Pfizer Animal Health, and the $2,500 Devoucoux Hunter Prix, the first qualifiers of 2011 for the Pfizer $1 Million Grand Prix and the Diamond Mills $500,000 3’3″ Hunter Prix Final, respectively. Andres Rodriguez of Boca Raton, Florida, and Andres Olivares’ Davinci took home the victory in the $25,000 HITS Grand Prix, presented by Pfizer Animal Health. The class saw 33 starters take the field on a course designed by Jerry Dougherty of Bokeelia, Florida, that produced six clear rounds for the jump-off. The first clear round of the class came early, when Paul Halpern of Montreal, Quebec, Canada, and Amanda Weaver’s Sevastian K, second in the order, jumped clean. Two trips later, eventual winner Rodriguez and Davinci forced a jump-off with a clear effort of their own. The next 20 trips saw team after team fail to overcome the course with rails down across the field. Green Cove Springs, FL – January 23, 2010 — Kelley Farmer, who hails from Keswick, VA, partnered with Rosalynn to capture the top spot of North Florida’s Inaugural $20,000 USHJA International Hunter Derby sponsored by Jerry Parks Insurance, Great American Insurance Group and The Bruning Foundation, held Saturday under the lights of the covered arena at the Clay County Agricultural Center in Green Cove Springs, FL. The evening was kicked off in the “Marques at Green Cove Springs”, the stylish and inviting VIP tent adjacent to the arena, with a delicious dinner provided by Carrabba’s Italian Grill and a very special Live Auction to benefit HOPE Therapeutic Riding Center. “While we raised a lot of money for HOPE, the generous bidders were big winners too. They got some outstanding deals on an array of items- like the Sea World Aquatic package and the Golf World getaway,” Tony Weight, President of North Florida Hunter Jumper Association, said. Kelley Farmer and Rosalynn were the Sanctuary High Performance Working Hunter champions during the first week of the 2011 FTI Winter Equestrian Festival. Photos © Sportfot, Official Sport Photographer of the FTI Winter Equestrian Festival, www.sportfot.com. 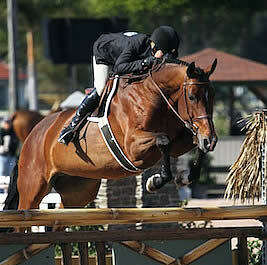 Wellington, FL – January 13, 2011 – The 2011 FTI Winter Equestrian Festival runs from January 12 – April 3 and will host the sport’s most talented hunter and jumper riders. The first week of competition at the Palm Beach International Equestrian Center continued today as professional riders sought championship honors in various hunter divisions. This year, the High Performance Working Hunter division sponsored by The Sanctuary at PBIEC has been added to the list of divisions for competition. The new division is open to all riders and horses, and includes fences ranging in height from 4′ to 4’6″. While eight horse and rider combinations competed over a two-day period, only one stood above them all. Kelley Farmer, riding her and Larry Glefke’s mount Rosalynn, topped the field winning all five of the division’s classes. 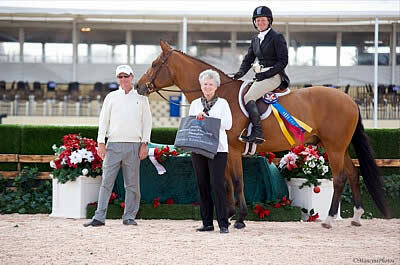 The five-for-five winning streak was quite a feat for Rosalynn and Farmer as it is the first week of showing at the 2011 FTI Winter Equestrian Festival. Francesca and Maggie Jayne. All photos © Jennifer Wood Media, Inc.
Washington, D.C. – October 27, 2010 – The 52nd annual Washington International Horse Show continued hunter competition for professional and amateur riders today, and a multitude of championship coolers, shining trophies, and fluttering ribbons were awarded. 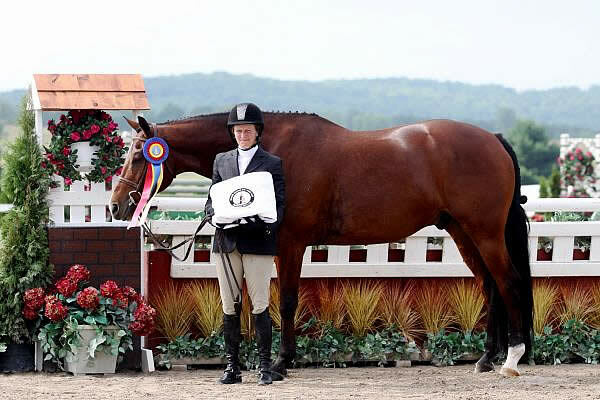 Maggie Jayne of Elgin, IL, rode Francesca for Pony Lane Farm to the Grand Hunter Championship. Kelley Farmer of Keswick, VA, was named the Leading Hunter Rider. 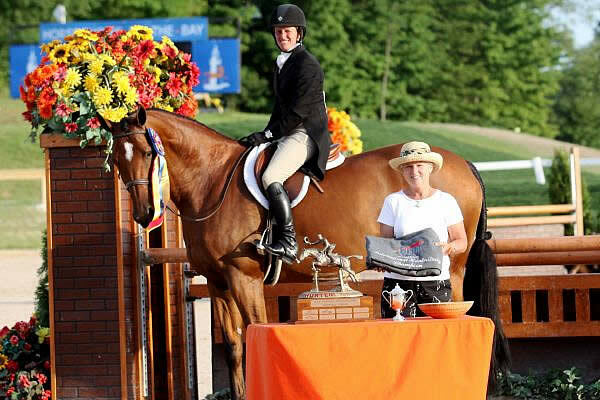 Stacy Arani of Dover, MA, and Bolero picked up the Grand Amateur-Owner Championship, and Arani was named the Leading Amateur-Owner Rider. The WIHS continues through Sunday, October 31. The highlight classes of the week are the $25,000 Puissance sponsored by The Boeing Company on Friday, October 29, and the $100,000 President’s Cup Grand Prix presented by Washington Convention and Sports Authority, CSI 3*-W on Saturday, October 30.